Option 1 matched the campus standard for pole-mounted lighting while Option 2 matched the installed lighting in the adjacent municipality that would run contiguous to this project. The stakeholders needed to decide if this residential neighborhood was to look like an extension of the college campus (Option 1) or an extension of the adjacent municipality (Option 2). 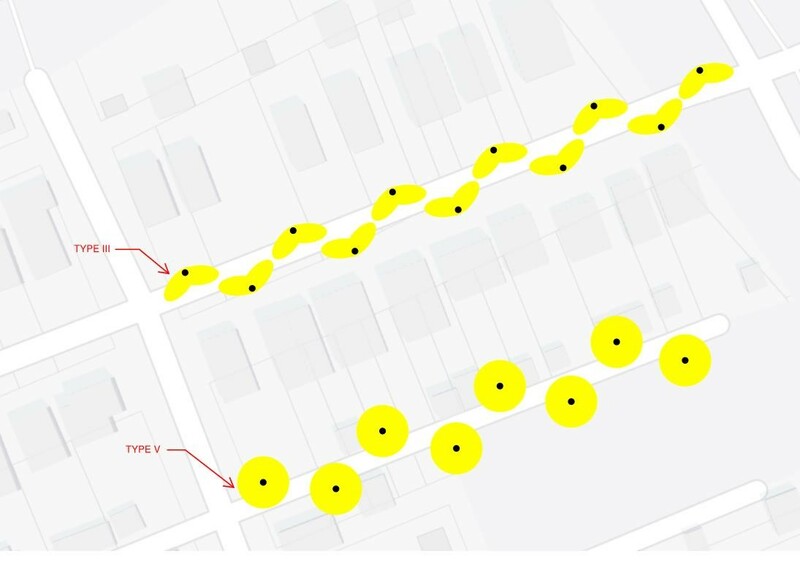 Ultimately, it was decided to match the campus standard, with an option (bid alternate) to install Option 2 on a single street to continue the adjacent municipality’s look. Once the look and feel of the lighting was chosen and agreed upon, the optics and lumen output was selected. The illumination criteria set earlier helped establish the requirements for height, spacing, lumen output, and lighting distribution type. A photometric model was created to evaluate the foot candles of the horizontal plane measurement at the ground as well as the vertical foot candles measured three feet above finished grade. The vertical foot candles were evaluated in both directions to simulate a pedestrian walking towards the light source or away from the light source. New lighting was proposed to be installed on all of the streets within the project scope, with the pole-top fixtures mounted on 12-foot poles. The selected lighting fixtures are Type III fixtures with pole type, color, and bases chosen to match the existing campus standard. The proposed alternate matched the municipality-standard lighting fixtures along the contiguous street. This modification allowed for a match between the existing installed street lighting with the lighting installed to the north of Campus. The lighting layout provided fixtures on both sides of the streets in a staggered pattern. Lighting on the same side of the street is placed at approximately 100-foot intervals, with lighting on the opposite side of the street placed at the midpoint to create the best balance of lighting. All lighting is positioned and designed to avoid glare going through the windows of the homes in the neighborhood. All lighting is owned and maintained privately. Our design layout is generic and does not account for plantings, private walks, and utilities. Specific lighting layouts will take these obstacles into account with the assistance of a civil engineer and a formal survey. This will take place during the Construction Documents phase of the project. This generic layout shows the differences between two common types of lighting distribution. Type V sends light out in all directions, which has the potential to allow light to enter resident windows. The proposed Type III lighting allows the light to be directed forward and to the sides, providing light where needed and protecting residences from light trespass. Wiring was designed to be run underground in PVC schedule 40 conduit, with conductors sized to avoid voltage drop. Lighting fixtures will be mounted on rebar-reinforced concrete pole bases installed flush to finished grade. The lighting will be fed from pedestal-mounted, utility-approved meter bases with integrated electrical panels. A total of three services will be installed to support the installation. This set-up requires a responsible party to pay a utility electrical bill for energy used. Existing cobra head lighting in the area will remain to illuminate roadway intersections, although we recommended new LED fixtures with better optics. This will reduce the disability glare that is currently present and will aid in security illumination. 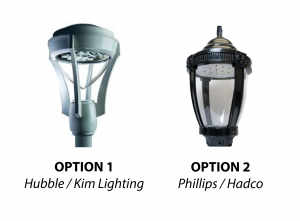 All cobra head lighting modifications will be provided, installed, metered, and maintained by the electrical utility as per existing municipal agreements. All new lighting, conduit, and meter base pedestals will be installed within the existing right-of-way. Through this three-blog series I’ve attempted to illustrate the process followed by professional lighting designers, from the initial design concepts through the nuts and bolts of working to evolve the design vision to constructed reality. As mentioned in the lighting trends post, lighting design is becoming a highly-specialized profession, which is hopefully demonstrated through this case study. Have a need for professional lighting, whether exterior sits or building interiors? Contact JDB Illumination and reach out to me at cmalesic@jdbe.com or 717-434-1558. As for the campus pedestrian lighting project, it is ongoing, with the next step involving the comprehensive lighting plan working its way through the various approval processes.